Seattle Department of Transportation crews plan to continue work on expansion joints on the Aurora Bridge today. The right-hand northbound lane will be closed from 10am-2:30pm, unless it starts raining. In the event that it rains, roadwork will be rescheduled for a later date. Freshmen at Seattle Pacific University began their first day of college by serving several communities around Seattle. Nearly 800 students and teachers participated in SPU’s annual CityQuest on Saturday. The event, which is “strongly recommended” for incoming freshmen, began nearly 20 years ago as a way to help students discover the city, as well as introduce community involvement as part of their college experience. 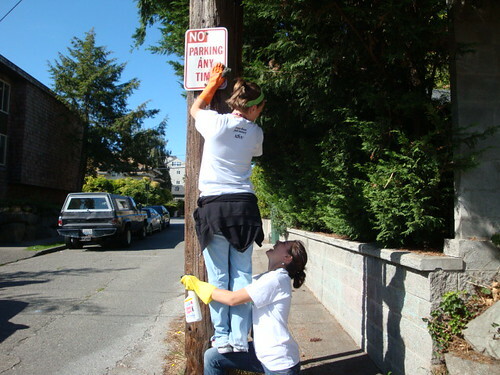 One group of more than twenty students and a faculty member helped at Fremont Abbey Arts Center, where they painted, cleaned graffiti around the neighborhood, picked up trash and fixed things as needed. Another group helped refurbish elementary science units at the Seattle School District P-12 Inquiry-Based Science Program on N. 35th St.
SPU has ongoing community projects throughout the year. If you have a group or non-profit that would like to connect with student groups, register on the school’s Volunteer Database or get on a list for next year’s CityQuest by emailing Owen Sallee at owen@spu.edu. 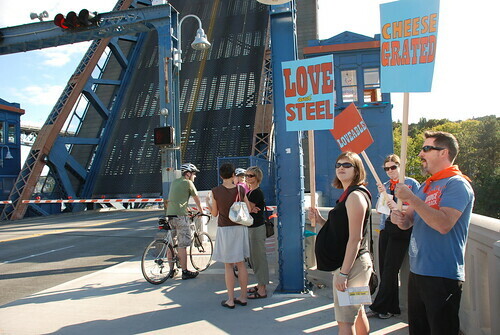 People driving through Fremont yesterday may have wondered what was going on at the Fremont Bridge. There were people carrying colorful signs dressed in colorful shirts. The bridge was laced with colorful pennant strings. Despite the parading and fanfare, it wasn’t a protest. This was a celebration. 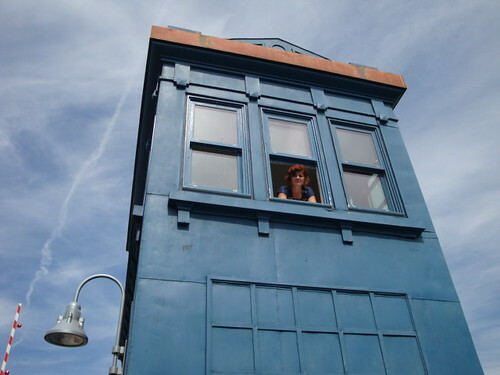 “Bridge Talks Back” is the result of artist Kristen Ramirez’ summer-long residency inside the northeast tower of the Fremont Bridge. 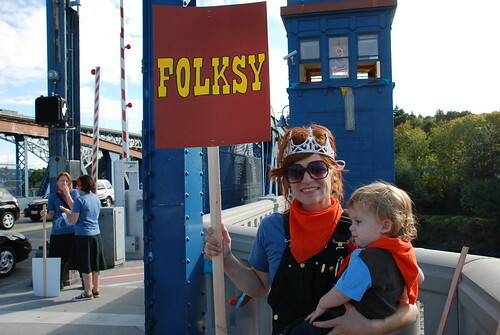 For the past three months, she collected sounds from in and around the bridge, as well as Seattle residents’ stories of it, and compiled them into a sound art project that honors the historic Bridge through all of its daily rhythm and noises. 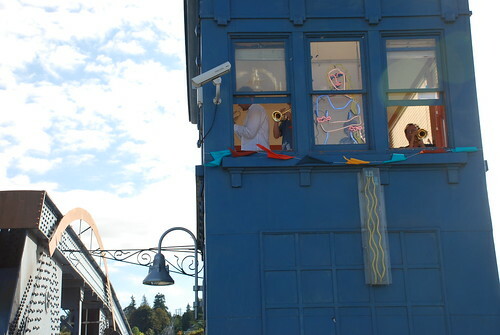 For the installation’s opening, sixteen different horn players were stationed inside the bridge’s four towers. As cars began stopping for the bridge to go up, they played a piece composed by Fremont-based trombonist Tom Yoder. The recording of various sounds, from cars and horns to birds and bells, were then played over the structure’s overhead speakers. Each time cars sat idle for the bridge, nearly one hundred performers engaged in choreographed fanfare with handmade signs. The public art project was commissioned by the Seattle Office of Arts & Cultural Affairs from the Seattle Department of Transportation’s 1% for Arts Fund. The audio composition will continue to play over the bridge’s speakers during daytime bridge openings from now through April 2010. You can also hear those recordings, as well as those of residents’ bridge stories, by calling 1-800-761-9941. The Smithsonian’s Museum Day 2009 is tomorrow, which means it’s a great opportunity to check out what some of our local museums have to offer. All day Saturday, receive FREE general admission to any participating museum location. All you have to do is fill out and download an admission card. Nearby, you can visit the EMP|Science Fiction Museum (325 5th Ave N) on Queen Anne. In Ballard, there’s the Nordic Heritage Museum (3014 NW 67th St). And in the U District, there the Henry Art Gallery (15th Ave NE and NE 41st St) and Burke Museum of Natural History and Culture (17th Ave NE and NE 45th St). Make a day of it and have fun at the museum! Seattle Department of Transportation crews will be making more repairs to expansion joints on the Aurora Bridge on Monday. From 10am-2:30pm, the left southbound lane is expected to be closed for most of the bridge length. The left northbound lane will also be closed prior to the bridge deck. Warning signs will be in place to alert motorists of the closures. CityQuest is a 20-year-tradition aimed at introducing community service to the whole college experience. Projects include removing graffiti, fixing houses and cleaning parks at 32 sites in different neighborhoods. In Fremont, students and staff will be at Fremont Abbey Arts Center, where they will be doing outdoor neighborhood cleaning, interior painting and cleaning, and carpentry work. Another group will help at the Seattle School District P-12 Inquiry-Based Science Program, where they will refurbish elementary science units. For a complete list of all the CityQuest projects around town, click here. Update: It’s not too late if you’d like to be part of the celebration. Interested performers must be available from 12-4pm. There will be a check-in tent on the Queen Anne side of the bridge near The Nickerson Street Saloon. 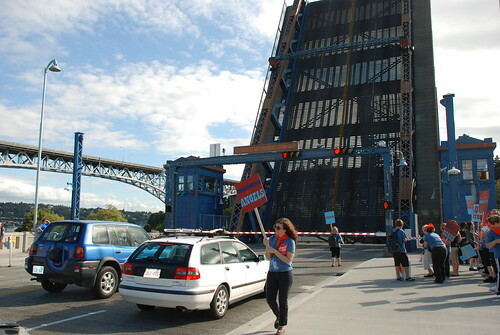 Whether they intend to or not, cars and pedestrians stopped at the Fremont Bridge on Saturday will witness the opening of artist Kristen Ramirez’ public art project. “Bridge Talks Back: A Sound Artwork” is the result of her summer-long residency inside the Fremont Bridge. Between 1-4pm, drivers waiting for the bridge to go up can expect to sit back and enjoy choreographed fanfare each time the bridge opens. One hundred performers and musicians have volunteered to be part of the celebration, and 16 different horn players will play out of the structure’s four towers. A sound collage will blast over the bridge’s sound system, and will include clips of boats, birds, bells and the bridge itself. 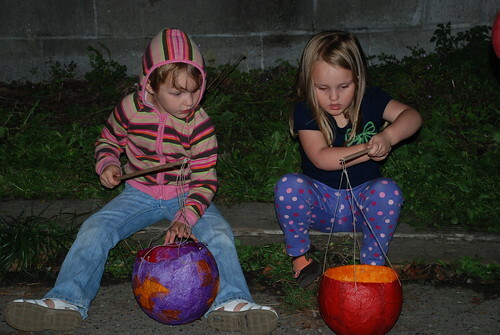 Hundreds turned out to participate in the annual “Luminata” lantern walk around Green Lake on Tuesday night. 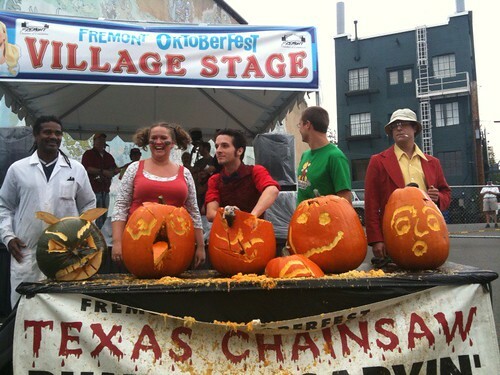 Organized by the Fremont Arts Council, the procession celebrates the autumnal equinox. 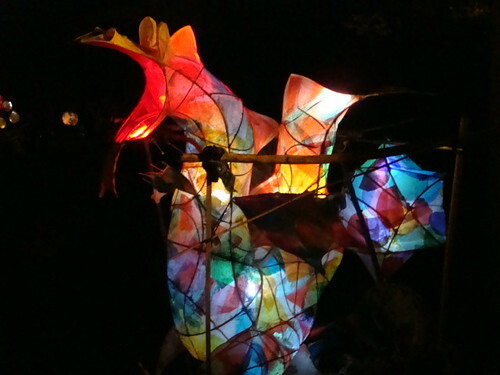 For the past few weeks, local artists lead a series of workshops where people could learn to make their own lanterns. 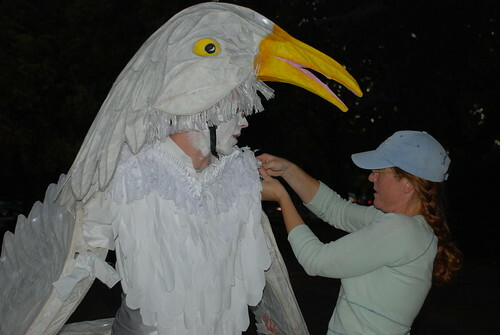 Above, artist Leslie Zenz adjusts the bodice to her illuminated bird costume. It took two full weeks of 8-hour days to create “The Bird and The Mayor”. 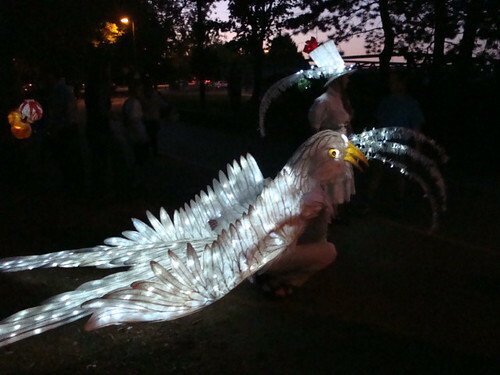 The cane and paper luminaria were originally created to be worn by stilt walkers as part of the Arts-A-Glow festival in Burien earlier this month. This impressive “Dragon” also took weeks to make. People of all ages were invited to participate in the parade. 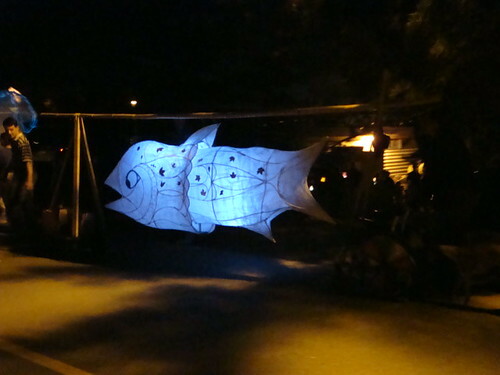 Handmade art lanterns were carried by both hand, boat and with this “big catch”, bikes. Music and singing could be heard all along the promenade. The festival concluded with hot cider and treats. Happy Fall to everyone! There will be lane closures today on the Aurora Bridge. The Seattle Department of Transportation says that the two center lanes (one northbound and one southbound) on the Aurora Bridge will be closed down from 10 a.m. to 2:30 p.m. while crews repair the expansion joints. Two lanes will remain open in each direction. 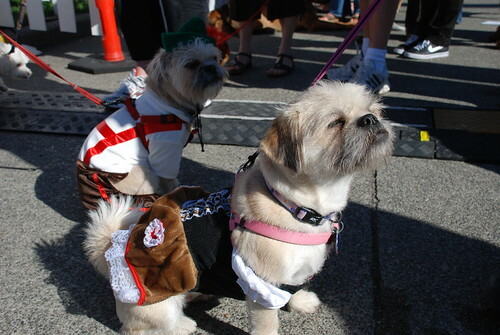 After three days of celebration, Fremont Oktoberfest came to a close today, officially kicking off the fall season. 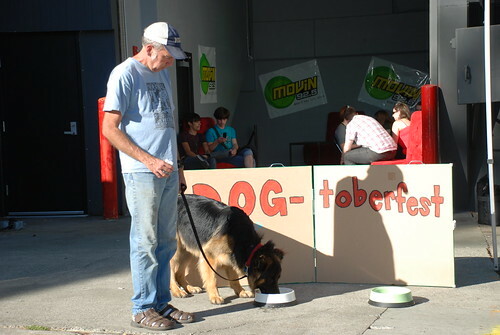 After starting the day with the Brew Ha-Ha 5K Run/Walk and Street Scramble, the event also turned into “dog-toberfest” with Dog Day Afternoon activities taking place throughout the rest of the day. In honor of The Simpson’s 20th Anniversary, CityDogMagazine held a Santa’s Little Helper Dog look-a-like contest in conjunction with its Cover Dog Model Search. 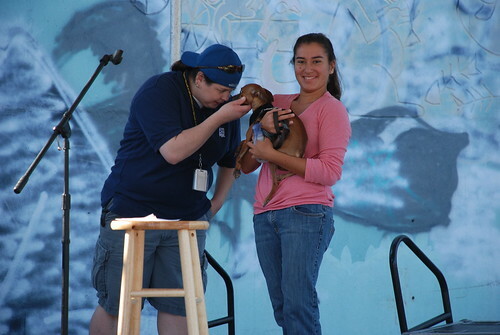 Proceeds from entry fees benefit Reading With Rover, a non-profit that helps children develop literacy skills. One-year-old pug shih-tzu Toby got dressed to impress the judges. His one-year-old sister, Bella, however, didn’t look quite as pleased to get dolled up. Simba, a blind rescue dog from Turkey, had no problem striking a pooch pose. 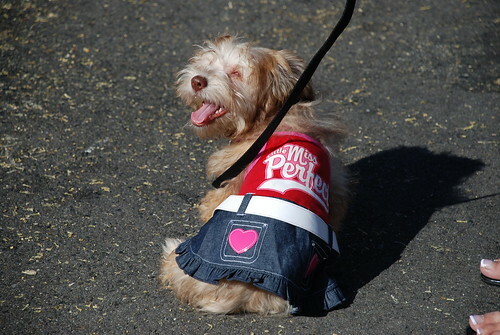 This little doggie was the eventual winner in the look-a-like contest. Five-year-old Shi-Shi won the Cover Dog competition, moving him onto a final round. 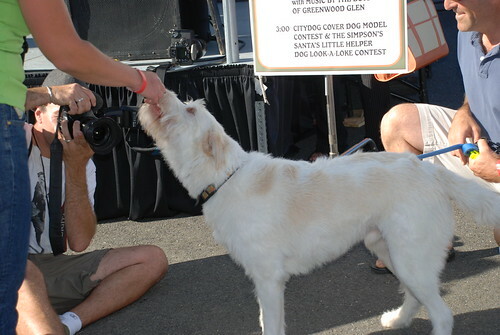 Winners from select events will be chosen by CityDog Magazine readers to grace the cover of the magazine’s Winter 2009-2010 issue. 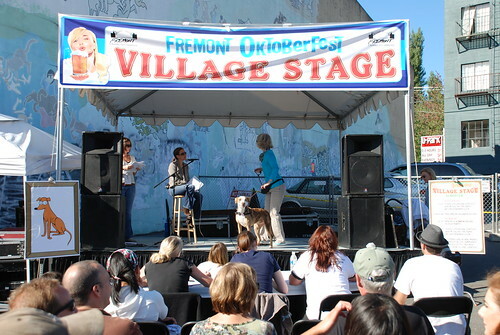 The last qualifying event takes place at U Village’s FidoFEST on September 27. 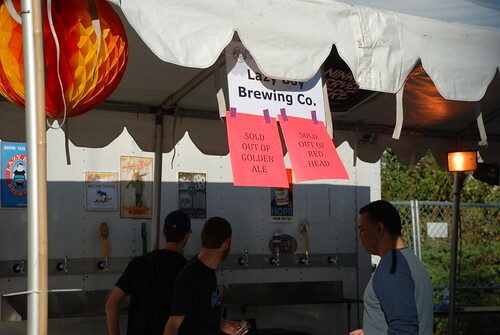 Despite more than 80 brews on tap, by mid-afternoon many of them had already run out. 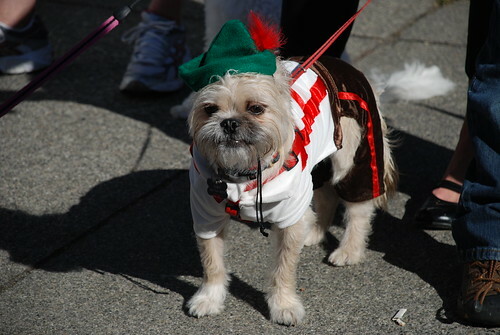 Until next year’s Fremont Oktoberfest, auf Wiedersehen!